Finally, a quality, fun and entertaining children’s novel about home schoolers! 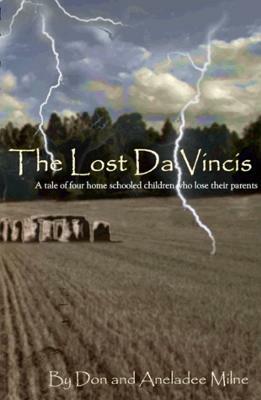 In The Lost Da Vincis, four resourceful home school siblings discover their parents and youngest brother have disappeared. Was it caused by one of their father’s science inventions going terribly wrong? Will the children be able to find their parents before anyone finds out that they are all alone and haven’t told anyone? Will their father’s chief rival ruin everything? Children of all ages will enjoy reading the adventures of 14-year old Sophie, 13-year old twins Frankie and I.T., and 11-year old Eddie. Will they find The Lost Da Vincis? Mom and Dad! This is a great read-aloud fiction book for your home schooled children. Don and Aneladee Milne are home schooling parents of six children. This is their first book together. Don works as a banker by day because his ideal career as a parody lyricist is for paupers, unless your last name is Yankovic. Aneladee is the author of The New Commonwealth School and the co-founder of Leadership Education Mentoring Institute. She is a popular seminar speaker throughout the United States and Canada. Traditional version at LEMI books. Join in and write your own page! It's easy to do. How? Simply click here to return to Make a page.